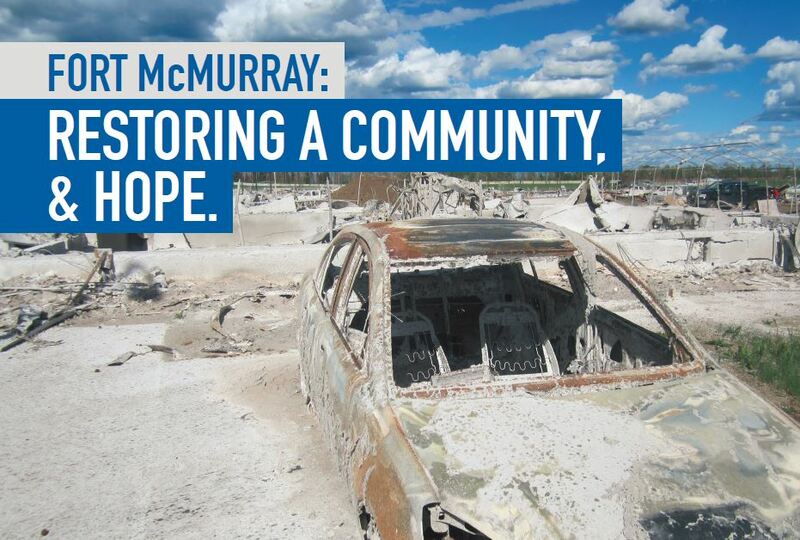 When a wildfire, a blaze known as “The Beast”, swept through Fort McMurray, Alberta, in the spring of 2016, it destroyed homes, displaced people, and devastated entire communities. Among the affected was Northern Lights Regional Health Centre (NLRHC), a 136-bed hospital spared by the fire, but left inoperative due to severe smoke and water damage. In a time of crisis, and of this magnitude, the thought of a major local hospital shutting down was of little comfort to residents and evacuees. NLRHC needed to be brought back to full operations–and fast. EllisDon was asked to take on this project; Mark Solomon, senior manager, Project Management Services Division in Western Canada was the first to respond. After a preliminary assessment of the damage and work required, the project management (PM) team formed quickly with each member having been selected for their unique skills and expertise. Among them were Kevin Smith, mechanical and electrical coordinator, and Jason Clouthier, senior project manager, who were already working on other projects at the time. To them the disaster hit too close to home and they knew timing was critical. Without hesitation they backfilled their current positions, left their homes and families in Calgary, and set out to Fort McMurray not knowing what to expect, but assuming the absolute worst. Without accommodations even available, Jason headed to Fort McMurray in a rental car packed with food provisions and sleeping bags to meet with the rest of the ED and site assessment team. They were prepared to take whatever necessary steps required, even if that meant sleeping in their vehicles onsite at NLRHC. The state of turmoil experienced upon arrival was unimaginable. A city, home to 90,000 residents was completely shut down and devoid of any people. Eeriness cast over the quiet and empty streets. Not a single store, gas station, or restaurant was available. The single notion of a simple cup of coffee or snack as a relief from the work day stress was inaccessible. It was clear that this task would be taxing, both physically and emotionally. Heading to a place that people just fought to escape, and knowing they would experience much discomfort speaks volumes to our people’s courage and resilience. When Kevin arrived, guided by Jason’s initial assessment, he was ready to go. “Driving down the deserted main street of Fort McMurray, without a single vehicle or pedestrian in sight in a normally bustling city, was a very humbling experience. For our team this drove home the dire situation Fort McMurray was in and further motivated our team to stay on course and provide any and all support we possibly could,” explained Kevin Smith. NLRHC was an integral part of the community. The pressure of knowing how many people relied on it posed to be the greatest challenge. Not knowing when they would be returning home to their families made it even more difficult. With this shared sense of urgency our team worked meticulously to find the means and methods to overcome these hurdles. In no way was this project ever perceived as a 9-5 regular workday. The contracted Emergency Reaction Company worked 24 hour days and we worked alongside them. While project management is nothing new to us, this was a case where combining the right group of people played a crucial role in successful completion. Our value was the ability to effectively communicate with both the emergency contractor and the client. Working with the emergency contractor, our team applied their enhanced construction knowledge and oversaw the project in its entirety ensuring best practices were used to meet the client and community needs. As a result of EllisDon’s involvement and ability to pull in all the best resources, the project timeline was significantly reduced and the hospital was reinstated weeks before the original scheduled date. Having exceeded all expectations, Alberta Healthcare expressed the utmost gratitude for the efforts displayed by all those involved. Our quick reactions resulted in another satisfied client and a trusted relationship. This project was unlike the rest. It was a true reflection of how passion and dedication go beyond a job description. Our team used their talents in a meaningful way to help people in a time of need and witnessed firsthand how their efforts not only restored a hospital, but the hopes within a community. It’s a type of fulfilment that few experience. “Standing on the rooftop of NLRHC on June 1st, watching the first residents cresting over the hill on Memorial Drive gave us an emotional sense of pride for our first major milestone turnover. Knowing we had made a small contribution that allowed these residents and families to return home and start rebuilding their lives gave us an overwhelming sense of pride and accomplishment,” Kevin described. On June 17th, NLRHC proudly announced the birth of the first child since the hospital reopened. To everyone on the project, It was a surreal experience that was made real knowing they made it possible for this family to return home in time to welcome their newest member. What an enlightening story, congratulations to the team at EllisDon! You jumped in when the need arose and successfully completed what needed to be done. Even for those of us who had friends, family or coworkers up there when the fire hit, we (easily) forgot or didn’t even think about the sacrifices that you made; filling a rental car with food provisions, sleeping bags and absolute necessities you would need to get the job started. I wonder if many of us would actually be able to step in as readily as you did and work under such taxing circumstances. What an amazing company, team and job you’ve done, be proud of yourselves for a job well done.